In 1985 Mark Hofmann blew himself up with his own pipe bomb. Police immediately suspected him as the prime suspect in a rash of bombings in 1985. In this next conversation we’ll talk about how his lawyers tried to get Mark to take a polygraph test. He passed with flying colors. How was Mark successful in fooling lie detector? Shannon Flynn will tell us how. A good examiner will get a person really stressful so that they react strongly, physically when they are telling an untruth. When you hear about that sweating, that galvanic skin response, that’s one of them. They will test for that. They’ll test your breathing rate. They’ll test your pulse. When I had mine there were six different indicators going on. When Mark did his there were just four because it was being done remotely. I mean the way he was able to beat the polygraph, he had very competent examinations and reads and they all showed him to be telling the truth. The way that those polygraphs work is, they work on what is known as the zero-null system. In other words they put up a scale. Zero is the center, then it goes -1, -2, -3, -4, all the way to -15, whatever, and then +1, +2, +3, whatever. When a test is scored, they will give a number, but the number will be +1, or -3, or +10. Generally between -5 and +5 is a null reading. They can’t tell. They person has been messing with the test or the examination wasn’t done well. They can’t tell so it will be towards the center of that. But then when you get to -10, -11, -12, very untruthful and easily seen; +10, +12, +15, very truthful. Mark scored a +14. I scored a +12. That really bothered those examiners when they found out he had beat that test, it just really bothered them. It turns out the main person up at the University of Utah, David Raskin was able to arrange an interview with Mark when he was in prison about two years, a year and a half, two years afterwards, because he wanted to find out how in the world he was able to do that. This is what Mark told him. 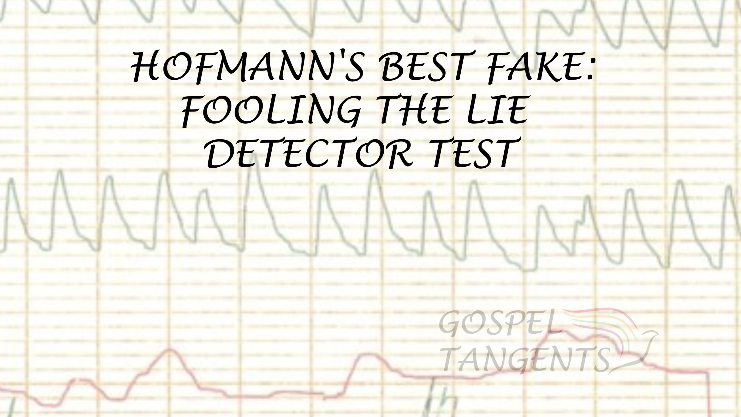 Don’t forget to learn about Hofmann’s coin forgeries, cheating people, and his Million-dollar Con. Check out our conversation…..